Go Shuck An Oyster: Oysters Can Raise Money this June - act now. Oysters Can Raise Money this June - act now. Staff members from Go Shuck An Oyster.com have been working on the planning committee of the TJS Softball Classic and Family Fun Day since it started. The Todd J. Schwartz Softball Classic honors the life of 19-year-old Todd Schwartz, a vibrant college student and Dana-Farber patient who died of cancer in 2002. This all-day, round-robin softball tournament incorporates countless activities for individuals, families and children, as well as a large silent auction and barbecue. Since 2003, this event has raised more than $250,000 for the Jimmy Fund's Family Festival, an annual event for Jimmy Fund Clinic patients and their families. This year, as we aim to add new and exciting items to the silent auction, we decided to combine two of our passions: raising money for charity and oysters. - and anything else you might have to donate. Financial contributions can be made through the Jimmy Fund website. Just click here and then click on the link to Make a Gift. If you would like to attend the event on Saturday, June 12, 2010, we'd love to have you there. You may register online here. The cost is $25. $75 if you want to play softball. You can submit a team or be placed on a team. Families pay just $100. Food, drink and a good time are included. 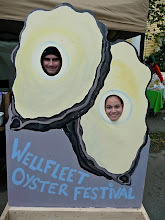 We thank Island Creek Oysters in Duxbury, MA for donating an oyster gift pack. Learn more about Island Creek Oysters here.